Finding America's way back through the dark night. I had a phone conversation with a fellow Palin supporter last night. I reminded him of a conversation we had before Sarah Palin was chosen for VP. I told him then that I was very disheartened by the political landscape. I wished we could have taken all the candidates (McCain's war hero status, Romney's charisma, Rudy's national defense abilities, Thompson's conservative philosophy, Ron Paul's economic theories and Huckabee's evangelicalism) and combined them into one candidate. My point was, I didn't see a Reagan in there. He asked me what would happen if Obama won the presidency. I told him, I'd have to suffer. I told my friend that I don't know how I would be able to get through an Obama presidency with no Reagan, no voice in the wilderness. I contemplated the idea that it would be worse than Bill Clinton. "We could be entering the darkest years our country has ever faced, Mike," I told him. Then John McCain introduced us to Sarah Palin. I can't begin to tell you how uplifting that was to me. I was actually able to contemplate losing the election knowing that there would still be a voice in the wilderness. When Obama won, I was disappointed of course. But I told my friend "let not your heart be troubled' (we quote that Hannity line back and forth to each other), we still have Sarah. "What do you mean?" he asked. "We lost." "I can survive it now, Mike," I told him. "Knowing that Sarah Palin is out there will get me through this Obama thing. She's the only thing that keeps me off the ledge." Ronald Reagan told us during his farewell speech: "My dream is that you will travel the road ahead with liberty's lamp guiding your steps and opportunity's arm steadying your way." I read Sarah Palin's op ed piece last night. It's a straight forward criticism of the President's Cap & Trade policy. It's not an announcement to run or a grand philosophical epic outlining the strategy for taking over the world. It's a conservative's view on a serious issue of the day. Standing alone, the piece is a strong argument against Cap & Trade. Put beside the punditry's voices and the speeches and writings of Gingrich, Romney and Huckabee it joins a harmonius voice of conservative opposition. But it's more than that. A lot more. 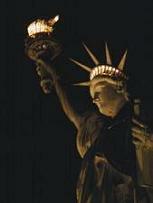 Standing with the backdrop of Palin's entire political career and what she means to our Republic, that op ed piece is her hand taking Lady Liberty's lamp, holding it so she can look at it before turning to us, the other hand gesturing for us to come follow her. "Don't get cynical because, look at yourselves and what you were willing to do and recognize that there are millions and millions of Americans out there that want what you want, that want it to be that way, that want it to be a shining city on the hill," Ronald Reagan said, his voice choked with emotion after the loss in 1976. Every day, I look at my Twitter account. When Sarah Palin tweets, it revives me. It masks the pain I feel when I watch Cap & Trade, Sotomayor, Obamacare, stimulus plans, bailouts and apology tours on the news. I see my America in her eyes. I hear my America in her voice. And I read my America in her words. It's our America. It's still out there. It's in the hearts and minds of millions and millions of Americans that want it to be a shining city on a hill. For four years as Jimmy Carter destroyed our economy and weakened our military, Ronald Reagan wrote op ed pieces and gave speeches. He didn't have twitter. But if he did, I'm sure there would have been millions like us signing on everyday to read the tweets of @RonaldReagan. As Governor of Alaska, Sarah Palin spoke through a microphone that was paid for by the people of the state. The Alaskans who filed ethics complaints in essence turned off the microphone. But now that she is no longer Governor, noone can turn off her microphone. And if they try now, you can rest assured you will hear her say "I am paying for this microphone, Mr. Breen." "What we saw was a red-blooded American with that rare, God-given ability to rally her dispirited fellow Republicans and take up the daunting task of leading them -- and all her fellow Americans -- on a pilgrimage to that shining city on the hill my father envisioned as our nation's real destination." Did Palin Resign Because There's an Emergency? This site is NOT authorized by Governor Palin, her staff, or any other candidate or committee. Opinions expressed are solely the responsibility of the site’s editor/publisher and any authors whose material is posted here.